Welcome to www.yorkshire-hotels.net, home of the Travellers Guide to Yorkshire, a useful resource to help you plan and book your next holiday, short break, business trip or family holiday to Yorkshire. We specialise in hotels, guest houses and self-catering accommodation across Yorkshire suitable for families, groups and couples, all bookable online 24 hours a day. Yorkshire is famous for the Yorkshire Dales and North York Moors and is popular for walking holidays. You will discover numerous castles, stately homes and many other tourist attractions in its popular old cities like York and seasides resorts such as Scarborough. 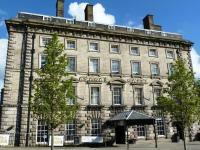 An elegant Grade II listed Victorian Hotel situated in the town centre of Huddersfield, the 3 star George Hotel offers space, craftsmanship and elegance and has been sympathetically modernised over the years whilst preserving its Victorian charm. 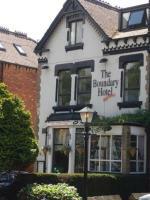 The Boundary Hotel is a budget hotel in Headingley, Leeds, ideally located just a 5 minute taxi ride from the city centre where you'll find boutique shops and bars. The hotel is right next to Headingley cricket and rugby stadiums so perfect for sports fans. Prince of Wales Hotel is a friendly family-run hotel and pub in a convenient location 5 minutes walk from Rotherham town centre and just a 10 minute drive to Sheffield. Prince of Wales Hotel offers recently re-decorated en-suite bedrooms with the choice of Singles, Twins and Family rooms. 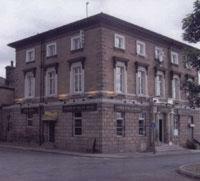 The Prince of Wales Pub has 3 large LCD TV's, SKY, a games room and freshly prepared food. There is also free Wi-Fi and free car parking. The Merrion Hotel is a comfortable 3 star hotel situated in a convenient Leeds city centre location with Leeds Bradford Airport only 8 miles away. Excellent local transport links and 3 conference rooms mean that the Merrion Hotel is an ideal venue for a business meetings. Copyright ©2009-2019 Hotels Online International Ltd. All rights reserved. A HOL-Canvas booking portal by Hotels Online.